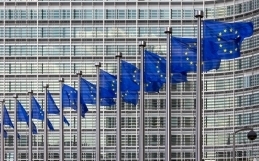 In the beginning of May, the European Commission will publish its Communication for the post-2020 Multiannual Financial Framework (MFF). The initial plans of the European Commission indicate potential changes to a range of financial instruments that have an impact on the protection and integration of children in migration, including the transfer of the budget for integration of non-EU nationals to the European Social Fund, the setting up of an Integrated Border Management Fund and the consolidation of multiple instruments into one External Instrument with a suggested focus or potentially earmarked funding on migration. The MFF needs to fully comply with the rights and principles enshrined in the EU Charter of Fundamental Rights and relevant international instruments, including the UN Convention on the Rights of the Child. Across the world, there are an estimated 31 million children living outside their country of birth, and there are an estimated 5.4 million child migrants in Europe. The EU has a responsibility to ensure that EU funding streams reach children in migration, seek to equally protect them and fulfil their best interests, regardless of their migration and/or citizenship status or where they are growing up. PICUM together with 35 other organisations, urge the European Union to prioritise the rights of children in migration in the post-2020 budget period, in the spirit of the 2017 Commission Communication on the protection of children in migration, the European Commission toolkit on the use of EU funds for the integration of people with migrant background, and the Sustainable Development Goals (SDGs). • Article 24 of the EU Charter of Fundamental Rights outlines clearly that the best interests of the child must be a primary consideration in all actions relating to children, whether taken by public authorities or private institutions. EU funds should be used in line with the UN Convention on the Rights of the Child (UNCRC), the UN Convention on the Rights of Persons with Disabilities (UNRPD) and the EU Charter of Fundamental Rights, among others. They should respect the guiding principles of both humanitarian and human rights law, including the ‘do-no-harm’ principle. • The UN Committee on the Rights of the Child in its Joint General Comments No. 22 and 23 (2017) with the UN Migrant Workers’ Committee and No. 6 (2005) clearly reaffirms that children should not be discriminated against due to their migration status, and that they should enjoy the same level of protection and care as any other child residing in the country. Therefore, EU funding streams for children should be underpinned by the principle on non-discrimination. • EU funding should be used to strengthen and /or establish robust child protection systems that protect all children on the basis of need and regardless of status. By investing in child protection systems, we ensure sustainable investments that will serve all children both in the short and long term. Children in migration should also have equal access to mainstream education, health services and services in the community, regardless of migration or citizenship status and be treated according to their individual needs. • Detention of any child because of their or their parents’ migration status constitutes a child rights violation and always contravenes the principle of the best interests of the child. Therefore, EU funding should never be used for actions that would encourage or result in immigration-related detention or other unlawful or arbitrary deprivation of liberty of children. • Institutional care can severely undermine children’s development. Structural Funds during the 2014-2020 funding period prohibited the use of funds for measures contributing to segregation or social exclusion of people, effectively ruling out the financing of institutions. For the post-2020 funding period, it should be guaranteed that EU funding is not used for the building, renovation or support of institutional care settings, that lead to physical and social segregation of children in migration. • EU funding should support transitional measures, including alternative forms of care, to prevent long-term stay of children in reception centres, refugee camps or hotspots. 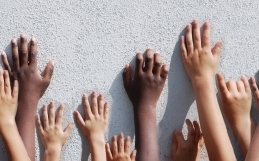 • As per guidance from the CRC, EU funding should be provided to develop and implement non-custodial solutions for children and families with children while their immigration status is being resolved, based on an ethic of care and protection, not enforcement, and carried out by competent child protection actors. They should focus on case resolution in the best interests of the child and provide all the material, social and emotional conditions necessary to ensure the comprehensive protection of the rights of the child, allowing for children’s holistic development. 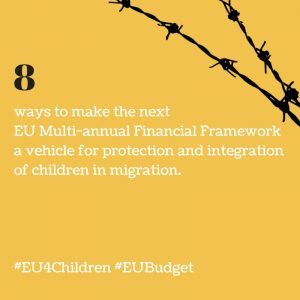 • Especially for unaccompanied children in migration, EU funding should be invested in individualised, quality family- and community-based care, within the frame of the country’s child protection system. In addition, EU financing instruments should ensure that especially frontline countries receive sufficient funding to establish well-functioning guardianship systems. • Families should be kept together. This means that EU funding should promote a family-based approach towards integration including psychosocial support, access to labour market participation and access to housing. Access to (early childhood) education and health services play a central role in facilitating integration and should be adequately financed. • Additional resources are needed for services to meet the needs of children that are victims of violence, abuse, exploitation and trafficking. • EU funding should be invested in empowering children and youth to participate in decisions that affect them, including child-friendly material and capacity-building of youth-led and other organisations working on issues facing children in migration. 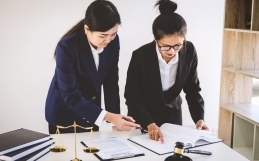 • Sufficient funding should be provided to ensure the availability of quality and effective legal assistance and representation, including through information and training. • The current financial framework includes several EU funds that strengthen child protection systems at the national level. However, some of these funds are hardly used. The next MFF needs to have monitoring tools and accompanying mechanisms to support maximal use, transparency and accountability. This should include a mechanism to allocate funding to civil society in line with the framework, when not being allocated otherwise, including actions to protect children in migration, regardless of status. • Ensure that the Partnership Principle is transferred to all internal and external funding instruments to ensure that civil society and service users participate meaningfully in the preparation, implementation, monitoring and evaluation of EU-funded projects and EU funding is directed for their capacity building. • The EU should require that organisations in direct contact with children have internal child protection policies in place in order to be granted EU funding. • There are no protection systems that follow children across borders. To ensure fewer children go missing or remain unprotected, more investments need to be made in the mechanisms for cross-border child protection, both within the EU and externally, including efforts to improve cooperation between child protection actors, with data protection safeguards. To read the full statement including the list of organisations who signed, click here.